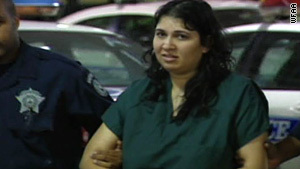 Saiqa Akhter, 30, told a 911 operator that she strangled her two children because they were autistic. (CNN) -- It's there on the 911 tape. "Why did you do this? "the operator asked the woman who said she had killed her two kids. "They are autistic," replied the mother. "Both are autistic. I don't want my kids to be like that." "I want normal kids," Saiqa Akhter, 30, said in the Monday emergency call. The Irving, Texas, mother is charged with capital murder in the death of her two children, Zain Akhter, 5, and his younger sister, Faryaal Akhter. The state's Department of Family and Protective Services confirmed to CNN that the boy had autism; it did not have information about the girl. Parents of children with autism say the challenges are daunting and often isolating as the kids can have outbursts, meltdowns and intense needs. But they say their children are also vital, loving parts of their lives. Autism's effects vary widely; it's a spectrum, not a single disorder, that impairs communication and social skills. While there is no cure, autism treatments and early interventions have been found to help. Several research studies have found that mothers of children with autism have higher levels of psychological and parenting-related distress than other moms of children with developmental delays. It can be overwhelming, said Marguerite Colston, vice president of the Autism Society, which has local chapters throughout the country. "Once you get a diagnosis, you can't be a parent, you have to be a case manger, an education specialist," she said. "You've got to figure out the medical system. It's overwhelming to think I have to advocate and navigate the system. The level of stress is terrifying." "Our nation doesn't have the system to support the parents. The services are not there to match the needs." In Texas, local Child Protective Services officials had worked with the Akhter family for two months in 2009, linking them with community resources to help them deal with the children's medical and developmental issues, according to the state's Department of Family and Protective Services. This week, Akhter told the 911 operator that she had first tried to kill her children with bathroom cleaner, but they would not drink it. So she said she strangled them with a wire. Akhter is being held in the Dallas County jail in lieu of $1 million bail. Akhter's uncle said that her son had autism and suffered from a severe speech impediment but had been improving with speech therapy, according to CNN affiliate WFAA. He also said that the 2-year-old girl had health problems. Relatives said the Akhter family was originally from Pakistan and had lived in North Texas for a while, according to WFAA. 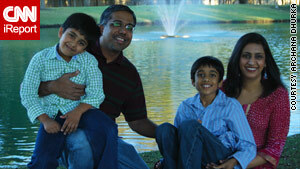 Archana Dhurka, at right, shown with her family, said raising Ankush, 10, also at right, is challenging and rewarding. Archana Dhurka, the mother of a child with autism in Plano, Texas, said she was disheartened to hear the story. Dhurka, who is of Indian descent, said it doesn't help that autism tends to be highly stigmatized in South Asian communities. Raising a special-needs child and a family while juggling work can feel overwhelming, she said. Once in a while, she said, "You get that feeling like, 'I just want to die.' It's hard. There's anger and a lot of emotions you go through. When you sit down and calmly think," she said, she realizes "that's not the solution." When Dhurka learned that her eldest son, Ankush, had autism at the age of 2, she didn't tell her family about it for three to four years. "It was just very, very hard," she said. The culture "especially in India, probably in South Asian countries, is you have to be the best, be super smart," she said. Parents want to be able to say their child, "does math, he's the top of the class, he's gifted and intelligent." The pressure is not limited to minority communities, as parents of children with autism experience anxiety and depression regardless of their socioeconomic group or race, said Dr. Wendy Stone, director of the University of Washington Autism Center in Seattle. "Parents who have less access to information, resources or to a community of parents who have similar experiences or needs are clearly going to have a more difficult time managing both their child and their own health," she said. Colston of the Autism Society, who is also a parent of a child with the condition, said local chapters are reaching out to affected Spanish, Vietnamese, Somali and other minority families. Dhurka hears the misunderstandings about autism and cultural issues from her and her husband's family. They know about Ankush's condition, but she says they questioned why the boy couldn't recite his ABCs and commented that Dhurka had worked too much during her pregnancy. Dhurka, who has a master's degree in computer science, left that career and is now an autism behavior therapist who works with immigrant families affected by the condition. "Some of the parents can hardly speak English," she said. Advocating for their children can be "very intimidating" for families with cultural and language barriers, she said. Some immigrant families come to her sobbing -- lost and overwhelmed. Dhurka can relate. Her husband travels frequently for business to be able to pay for Ankush's therapies, making their marriage a long-distance one. Her youngest son, who doesn't have autism, clamors for her attention. On top of that, she said, she has four-hour telephone battles with an insurance company to get Ankush's treatments covered. At some point, she breaks down to cry, too. But Ankush brings tears to her eyes for other reasons. The free-spirited 10-year-old always has a big smile on his face. He runs around singing along to his favorite Bollywood movies. He never masks his affection for his therapists or his family -- getting hugs and tickles. He relishes the joys in life, as he squeals and splashes in a swimming pool. When he utters new vocabulary words, Dhurka and her husband cry with joy -- Ankush is making progress. "We're seeing that parents may experience stress, they're very grateful for having their children and love them very much," said Brian Freedman, clinical director of the Center for Autism and Related Disorders at the Kennedy Krieger Institute. "We see both elements in the research." Dhurka talks to other families to help them overcome their denial about autism and connects them to support groups, medical experts and therapists. With the South Asian families in the group, she exchanges Indian recipes for children with special dietary needs. "It's a good place," she said, about a support network. "I'm not alone."